Weather • High, low pressure result in "down-slope" winds. 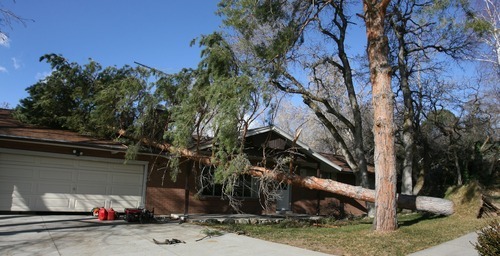 Steve Griffin | The Salt Lake Tribune Wind-toppled trees lie in the park strip of a Layton neighborhood Thursday. 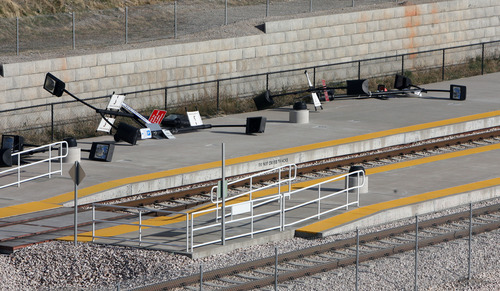 Steve Griffin | The Salt Lake Tribune Wind-related damage at a station in Farmington on Thursday, Dec. 1, 2011. Leah Hogsten | The Salt Lake Tribune Debris is strewn through Farmington from housing and business construction at Hunter Crossing in Farmington. Hurricane-force winds, in places topping 100 mph, ripped through Utah Thursday, overturning semitrailer rigs on Interstate 15, toppling trees and triggering widespread power outages affecting nearly 50,000 homes and businesses. Steve Griffin | The Salt Lake Tribune A UTA police vehicle blocks the entrance to the Frontrunner station in Farmingto after it was closed when high winds whipped through the Wasatch Front on Thursday, Dec. 1, 2011. Steve Griffin | The Salt Lake Tribune A motorist and Utah Highway Patrol trooper run to a semitractor trailer that had just been blown over by high winds near Farmington Thursday. 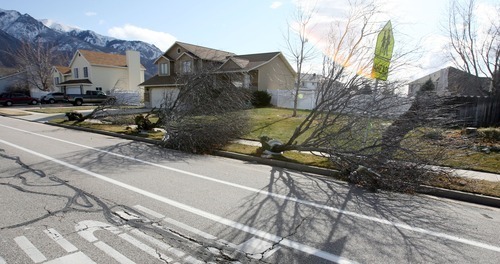 Steve Griffin | The Salt Lake Tribune Wind damage, such as this in Layton, is something typically beyond the control of a property owner, and generally covered by most policies. Insurance is capped only by how much insurance you bought for your house. 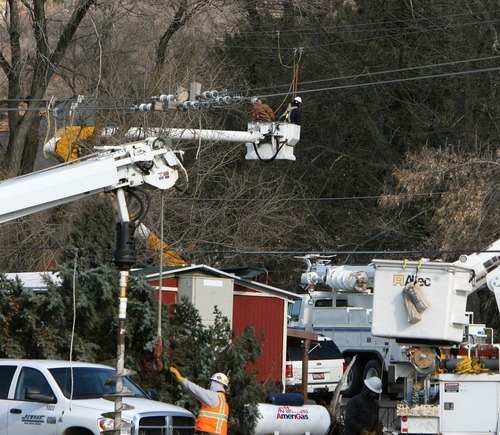 Steve Griffin | The Salt Lake Tribune Power crews work on electric lines on HIghway 89 in Fruit Heights on Thursday, Dec. 1, 2011, after high winds downed trees along the Wasatch Front. 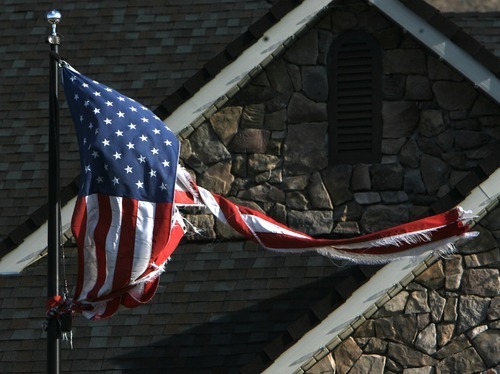 Steve Griffin | The Salt Lake Tribune A frayed and torn American Flag blows in the wind in Fruit Heights on Thursday, Dec. 1, 2011 after high winds whipped through the Wasatch Front. 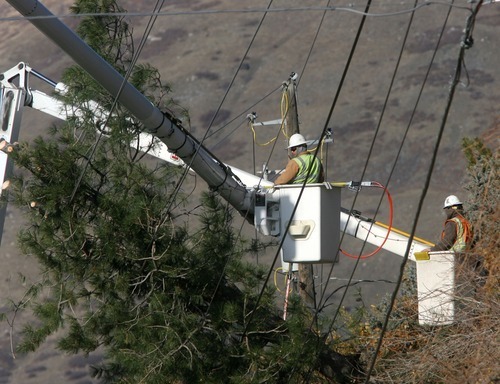 Steve Griffin | The Salt Lake Tribune Crews work on power lines in Centerville on Thursday after high winds downed trees along the Wasatch Front, causing power outages in Davis and Weber counties. 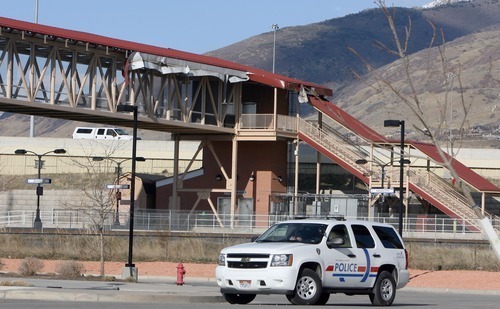 The strongest winds since 2000 ripped through Utah Thursday, the result of high pressure in Wyoming and low pressure in southern California that produced what meteorologists call "down-slope" winds. Gale-force winds were widespread, with gusts that were clocked at more than 100 mph in Davis County in the north and 90 mph in Washington County to the south. The cold winds pouring westward over the Wasatch Mountains flipped semis, uprooted trees, ripped up roofs and downed power lines in Weber, Davis and Salt Lake counties. The east-to-west wind storm was caused by a cold air mass coupled with a high-pressure system in Wyoming and low pressure in southern California and Nevada, said Larry Dunn, meteorologist in charge at the National Weather Service's Salt Lake City office. The unusual pressure imbalance set up cold winds that were channeled from the high pressure to the low. He compared it to water going over a dam. In this case, the Wasatch Mountains served as the dam. "The cold air is like water going over the top of a dam in a big sheet and it comes crashing in a big wave at the bottom," he said. "It's at the bottom of the dam where the winds are most pronounced. In this case, that's the Wasatch Front." The winds were fiercest in places where the mountain range is relatively narrow, Dunn said, such as Centerville, where gusts hit 102 mph. By contrast, in places like Sandy, where the mountains are higher and wider, the winds are less strong during such down-slope wind events. Weber and Davis counties were particularly hard hit, according to the weather service, where wind gusts above 60 mph were not uncommon. Utah sees down-slope winds from time to time, but they are usually relegated to canyon mouths along the Wasatch Front, Dunn said. But the cold air mass in Wyoming associated with Thursday's weather was so large, and the winds accompanying it so strong, that the ensuing wind event covered the entire region, including high gusts and damage as far away as southern California. Winds there left 340,000 homes without power Wednesday night and Thursday, according to the Los Angeles Times. In Las Vegas, 5,000 customers were without power following 60 mph wind gusts Wednesday, according to the Las Vegas Sun. "This is a huge [differential] of high pressure and low pressure. It's a gigantic weather pattern," Dunn said. "The last big ones like this, we had one in 1999 and one in 2000." Northern Utah saw little precipitation from the weather system. But central and southern Utah got snow that was expected to fall through midday Friday, Dunn said. "Southern Utah is getting hit pretty hard," he said. "We expect one to two feet in the southern mountains." The next storm system is expected to move into northern Utah late Friday and early Saturday, according to the weather service. It will bring cold temperatures but is not expected to produce much precipitation. Highs in northern Utah valleys should be about 36 degrees under partly sunny skies Friday. By Friday night, however, northern valleys will see a 30 percent chance of snow with lows in the mid 20s, according to the weather service. Saturday will bring a 20 percent chance of snow with a high of about 37 degrees.